FLYBALL - WHAT IS IT? It is is a relay race between two teams of dogs. There are two parallel lanes for two teams of dogs to race each other. Each lane has 4 low hurdles – spaced 10’ apart and at the far end a spring loaded contraption (called simply a ‘box’) which holds a tennis ball. Each team has its own lane and comprise of a maximum 6 dogs. 2 dogs are substitutes that can be changed in for subsequent races, but 4 dogs at a time run in each race, relay fashion over the 4 hurdles, trigger the box containing a tennis ball, catch the ball and return to the start. The handlers remain behind the start line. They release their dogs in turn and collect them at the end of their run. Tennis balls are used for most dogs - smaller dogs use mini tennis balls. When all four dogs have finished the course (and all have brought the balls back) the race is over and a winner is decided. During the race if any dog fails to come back with the ball, misses out any jumps or crosses the line too soon – ie. before the previous dog has come back - then it is a fault and to complete the race that dog must run again at the end. Flyball started in America in the 1970’s when someone invented a contraption whereby a dog could press the pedal and toss the ball to itself. A row of low hurdles was added then people formed their own teams and took part in tournaments. This has grown to be an International event. There are competitions in North America & Canada, Many of the European Countries, Japan, Australia and of course the UK. The best recorded time in the UK is 14.74 secs recorded by Joe Lamonts Tails we Win - WORLD BEST – is 14.18 secs by Katy Kaylors Touch 'n Go, we are extremely lucky to have a hot line to Katy, she trained our trainers! The best times are to be found in America and Canada but Britain is currently the 3rd rated Flyball nation in the world. Worldwide in 2016Live Wires best time of 16.13 secs is 6th in the UK and ranked 87th from 1356 teams recorded. 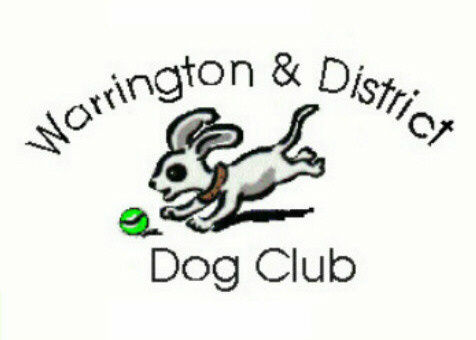 IN THE BEGINNING… following a flyball course we attended, 5 of us created Warrington & District Dog Club. Only 2 of those members still remain – Team Manager, Anne and her husband Geoff. We set it up mainly to run flyball teams, which we called LIVE WIRES. We chose a name that was synonymous with Warrington town. In years gone by Warrington, was particularly famous for manufacturing Wire products. The local Rugby League team was even nicknamed ‘The Wires’ – though now called ‘Warrington Wolves’. All our teams have the name ‘wires’ in their title. At first we also used to wear Warrington colours of yellow and blue - which we wear for our Crufts teams now - our BFA team colours changed to red and black when we went to Sutton Fields. Most of our members are from Cheshire ie Chester, Runcorn, Warrington, Ellesmere Port & Frodsham but being close to the motorway network M56/M6 and easy to locate we also have members from as far a-field as Wigan, Liverpool, Stockport, Gt.Manchester, Wirral, North Wales and Shewsbury, Salop. Currently we have over 45 members with the large majority taking part in BFA and UKFL competitions we enter. We are members of both British Flyball Association (BFA) and UKFL running up to 7 teams in open sanctioned competitions. (Teams, dogs & handlers are listed, with photos in ‘Our teams’ on the site). Our top team Live Wires, were UK Record holders in 2011 & 2012 and double Champions of Europe and the UK in 2012. They have now won the British Championships 4 times 2007, 2011, 2012 & 2013 runner’s up in 2008 & 2010 and their best time to date is 16.13 secs (2014). We have 2 or more beginner’s teams and have a number of other young dogs in training who are not yet old enough to compete (ie.under 12 months old), if you are interested in joining us please get in touch, details can be found on the New Starters tab. We also run teams in Crufts flyball qualifiers - Warrington (Wizards, Warriors, Warlocks) to try and make it to the NEC finals each March. Warrington Wizzards were runners up in 2010 & 2011 and we won in 2018 and our YKC (Junior team), Warrington Wizkids won in 2012. A large number of dogs who come to training are border collies/working sheepdogs, ideally suited to the sport. We have a number of crossbreeds & rescue dogs but we also have other working breeds – eg. Lurchers, Labradors, Spaniels & Terriers - that can be equally as successful. Several of our cross breeds are also our smaller dogs and invaluable to keep jump heights lower. Any breed and size of dog can be trained to do flyball. They just need to be ‘ball’ mad and the owner very patient and enthusiastic. Flyball is the fastest growing dog sport in the UK. There must now be getting on for 200 clubs Nationwide (making up 600+ teams) and these are growing in number year by year. Many CLUBS host what are called SANCTIONED COMPETITIONS and invite all other UK clubs to participate. These OPEN competitions take place up & down the country and are mostly held over a weekend. LIVE WIRES often hold 3 competitions a year – occasionally preseason friendly event in March, then in May and September at Sutton Farm, Sutton Weaver. At one of the Sutton Farm competitions in 2015 there were over 80 teams from various parts of the UK competing. Competitions are organised so that teams are put into leagues (of 5 to 7) according to their best time. [On the BFA site is a current seeding list for all UK clubs]. Each team will race against all the other teams in their league. There is an alternative format that is becoming popular as well called Double Elimination they use in European events and latterly for the top 3 divisions in the BFA Championships. Often teams have a time trial before being placed in divisions which is then run on a knockout basis with any team knocked out needing to win to have the chance to be reintegrated back in the winning group. Following two losses however a team will be eliminated and will take no further part. UK Clubs enter their beginner dogs in what are called ‘STARTER’ teams. These are usually held the same weekend as the OPEN competitions and mostly arranged in the summer months though some take place indoors as well. Like open events the teams are placed in divisions and they usually run against all the other teams (round robin) in their division. The difference between the open and Starters is that in the latter the hurdles are lower in height and they have either netting from the start line, placed down each side of the hurdles and round the ‘box’ or barriers at both sides of each hurdle then low netting from the last hurdle round the box and back.This gives the dogs the racing atmosphere experience yet helps to keep each team in its own lane and not to miss out jumps. All dogs competing must be over 12 months of age. We recommend flyball to anyone who likes the outdoor life and enjoys spending quality time with their dogs. It is great fun - a very sociable activity. IF YOU THINK YOU & YOUR DOG COULD DO IT TOO? ….. Contact us (see Stater Training for contacts) for further details.